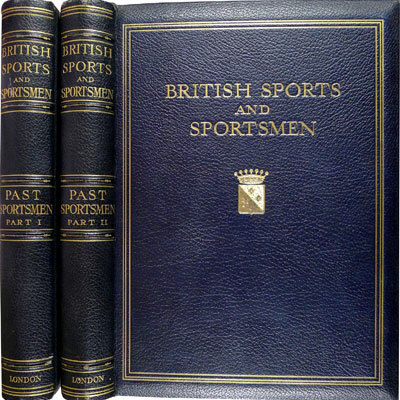 Circa 1913 - British Sports and Sportsmen, London - Royal edition, limited to 250 copies, of which this set is number 105. 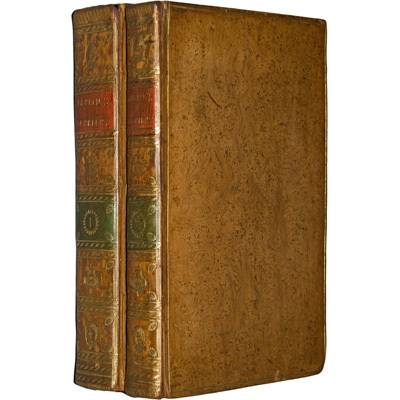 Two large finely bound folios containing the biographies of 303 of leading British sportsmen from the eighteenth and (primarily) nineteenth centuries, practitioners of the hunt, polo, steeplechase, cricket, rugby, boxing, and other gentlemanly pursuits accompanied by approximately 300 full page photogravure portrait plates. With a fascinating introduction by Horace G. Hutchinson. Volume I covers Hugo Meynell 1735-1808 to The Hon. Egremont Lascelles 1825-1892; Volume II covers George Parr 1826-1891 to Henry Arthur, Viscount Chelsea 1868-1908. Compiled and Edited by ‘The Sportsman’. Two large folio volumes [39x29cm] . Profusely illustrated. 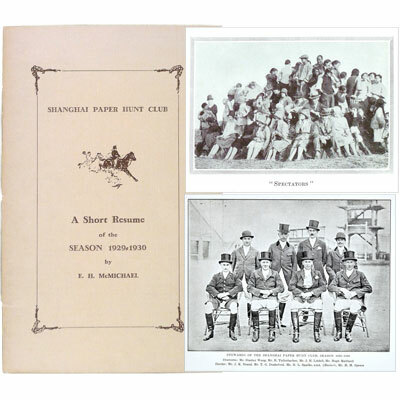 A remarkable insight into one of the important social events in Shanghai, from the late 1800s through to the 1930s. Introduced by the British, frustrated by the lack of animals for a proper hunt, the paper hunt involved one horseman who would ride ahead of the others to act as the hunted prey, marking the trail with coloured paper. One of the main rules was that only Mongolian ponies were accepted as a valid ride. The list of participants and winners is a veritable who’s-who of influential traders, bankers and diplomats. Founded in the 1860s in the midst of the Taiping Rebellion (1850-64), the Club thrived through revolutions, warlord control, communist insurgency and suppression, the Japanese occupation and civil war. 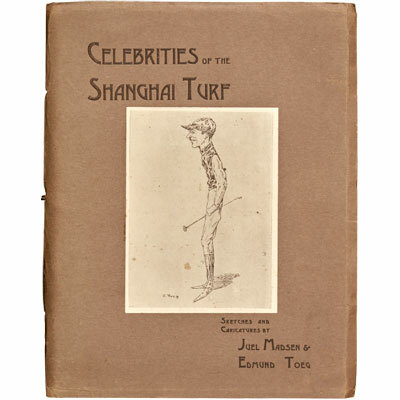 Containing anecdotes, poems, songs, black and white photographs including a long fold-out panorama photograph by Ah Fong of the Meet of the Christmas hunt 1929, drawings and cartoons by Edmund Toeg (including a colour fold-out of the winners of the hunt challenge cup 1910-30). Complete with six large-scale folding maps of the riding and hunting country. 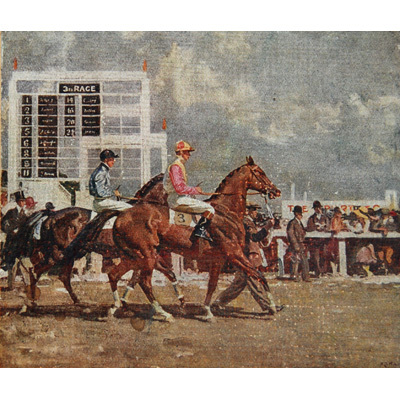 An extensive study on thoroughbred flat racing, covering breeding, training, jockeyship, the tote, the evolution of racing. 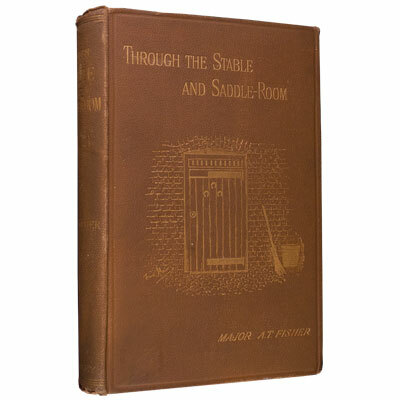 Illustrated with a colour frontispiece by Munnings, 34 full-page plates, and in text illustrations. The Lonsdale Library is unequivocally categorized as the greatest library of sporting ever produced. Inserted is an ad for “”The Mating of Thoroughbred Horses”. Introduction by the Right Hon. The Earl of Lonsdale, K.G., G.C.V.O., D.L. A handsomely bound edition, with a distinctly Glaswegian accent, being bound in Glasgow and owned by the renowned medical Professor David Fyfe Anderson. Containing a chapter on classical allusions to sport by Andrew Lang, and a lively preface to the Badminton Library by A.E.T Watson. 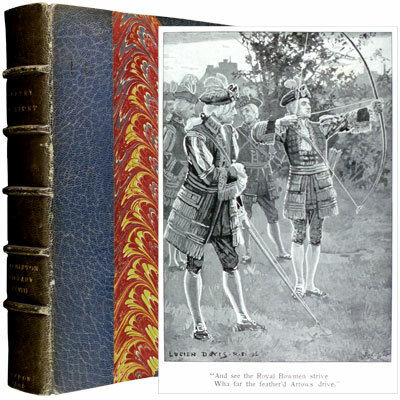 Accompanied with illustrations by artists A. Thorburn, Lucien Davis, and C.E Brock, among others, this is a lovely compilation of poetry on the subject of sport for young men in the late eighteen-hundreds, primarily depicting activities such as fishing, hunting, and shooting.